In the Miami Valley, it can get cold enough to turn your furnace on in October and keep it on until April. That’s 7 months of heated air. Cooler air holds less moisture than hotter air. That means when it’s cold outside the relative humidity is generally low as well. For the human body, dry air can cause increased allergy symptoms and other respiratory problems. For the house or office, dry air can draw moisture out of materials inside the house, such as wood floors, furniture, pianos, and walls. The most effective way to treat your building is to add a humidifier to the air furnace system if possible. Different installation types can be used depending on the location of your furnace to ensure the best performance from your whole house humidifier. Adding a whole house humidifier controls how much moisture is added so you feel comfortable, but ensures that the humidifier shuts off so that too much moisture isn’t added. With seasonal maintenance, whole house humidifiers need little attention. Humidifiers can also save on energy costs as warm, moist air feels more comfortable and the thermostat can be turned down a few degrees without a loss of comfort. There are different types of whole house humidifiers available for a home or business. Each whole house humidifier uses the same method to deliver humidity to the air though the duct work connected to the furnace. They require water to create humidity, a water collection medium such as a evaporator pad or cartridge, airflow through the medium to create evaporation, a water control valve, and a humidistat device to control the humidity level. Bypass, offered in a traditional flow through or water saving model, traditionally can be used in buildings up to 4,000 square feet. These models can be mounted on either the warm air supply or return air side of any forced air furnace. The traditional flow through model would need access to a floor drain, while the water saving model does not. Powered, uses a built-in fan which pulls in heated air directly from the furnace through the humidifier and can be used in buildings up to 4,200 square feet. These models work better than bypass humidifiers in tight quarters and are more efficient at adding humidity to the heated air. Powered humidifiers also work better with multi stage furnaces. Steam, the most efficient type of whole house humidifier at adding moisture to the building. There are several different types of steam models available. Some models require filtered water and some require a cartridge with electrodes that needs replaced after the heating season. Steam whole house humidifiers can cover up to 6,200 square feet. Since they use steam and do not require a bypass they can be installed in tight quarters as well. Steam whole house humidifiers work extremely well with multi stage and variable speed furnaces. Steam whole house humidifiers don’t need the furnace on to run, since they create their own heat, a properly installed unit is able to work by itself. Humid air feels warmer than drier air feels at the same temperature for most people, making them feel more comfortable when the air outside is cold. This allows the owner to adjust the thermostat down and saves money on utility bills without sacrificing how comfortable they feel. Keeping the air humidity level, the same during the heating season keeps the air you breathe healthier as well. Whole house humidifiers can help with dry skin, itchy eyes, chapped lips, snoring, dry throat, and can reduce sinus problems. According to EnergyStar.gov, a steam whole house humidifier saves $47-49 per year on electricity over a traditional whole house bypass and fan powered humidifiers. Assuming you keep your building between 30% and 60% relative humidity, the thermostat can be reduced a couple of degrees without losing any comfort, which can save up to 5% on your total bill for your furnace utilities. Properly maintaining your humidifier is a major key for its operational success. 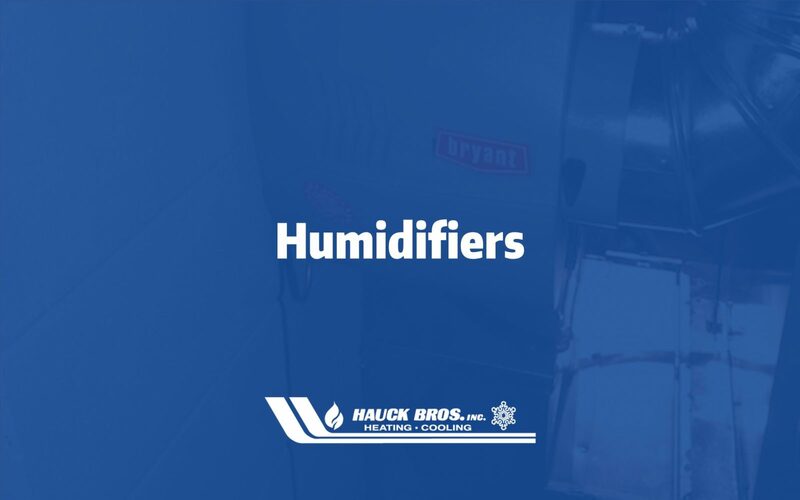 Make sure the water and power are off to the humidifier before servicing. Change the water panel at least once per season. Make sure the orifices are clear of debris. Make sure the supply and drain line are clog free. Make sure the humidistat or thermostat is operational and calling for humidity when the furnace is running. Ensure the solenoid valve is functioning properly. Visually inspect the water lines to make sure there are no leaks. For certain steam models, make sure to change the cartridge after the heating season. Ensure that at the end of the heating season the humidifier is properly shut down to prevent mold and algae build up. We offer these tasks from service and as part of our Platinum Home Comfort Protection Plan. Depending on how often it is used and how well it is maintained, the lifespan of a whole house humidifier can be 15-20 years with proper maintenance and inspections. Most manufactures offer a 5- or 10-year warranty on parts and a one-year warranty on labor. After about 20 years, the parts can be hard to find and/or expensive. Newer models tend to be much more efficient at adding humidity to the building and more energy efficient, especially the whole house steam humidifiers.